For ultra-smooth wood surfaces. The first time you use a scraper blade, you'll discover why it's a favorite tool of traditional woodworkers. Our versatile stainless steel scrapers leave wood surfaces ultra-smooth. They're also the best tools for smoothing plastic bindings, because they don't heat, soften or scratch the material the way sandpaper can. Occasional squaring and burnishing of the edges keeps them sharp and efficient (the Scraper Burnisher makes it easy). These scrapers are available with convex, straight and concave edges, for smoothing and fine-contouring wood surfaces on practically any instrument. Large scrapers have a variety of contours for trimming bindings, neck profiling, fingerboard surfacing, archtop contouring and graduating, wood deburring, acoustic bridge shaping, and more. Supplied unburnished. #0654 Rectangular 2-1/2" x 6" x .028"
#0628 Curved ends 2" x 6" x .028"
#0655 French curve 3-1/8" x 5-1/8" x .028"
Mini scrapers are for smoothing smaller areas with finer control. Among their many uses, the concave/convex version is handy for acoustic guitar bridge contouring, and the oval scraper makes quick work of spot-leveling drop-fill finish repairs. The rectangular version has rounded 1/8" and 3/32" notches for fast and easy acoustic bridge saddle crowning (a bonus inspired by an idea from Freddie Cisneros). Supplied unburnished. #0625 Concave/convex 1-31/32" x 1-17/64" x .016"
#0626 Oval 1-25/32" x 1-3/16" x .008"
#0627 Rectangular 1-25/32" x 63/64" x .016"
SAVE when you buy the Set of 6! Includes 3 large, 3 mini size scrapers. I've been wanting to get a set of these cabinet scrapers for quite some time. they've come in handy just when I needed it! Wow! I have done woodworking for years and kept passing these things by. No more. I just bought the Tenor Uke kit and thought I would use it for various things. This is a wonderful tool to cut down on sanding. This is a nice, quality tool. Needed to be burnished and since I did not have one, I made one myself. I will be using this a lot. Good tool, but not as good as the binding scraper. I'll buy the more expensive scraper and see if it's better. Very useful tools. 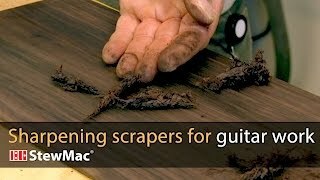 I have always used stewmac scrapers for shaping my guitars. I recommend it. The size is okay, but for the price I was expecting something a little more like traditional scrappers in terms of thickness. Hopefully StewMac will offer a product similar but with a heavier gauge of steel. This a tool I use a lot. Terrible quality. This tool is necessary to edit and re-sharpening. They're too cool! This one has some very handy sized curves that make life in the touch-ups lane a lot easier.